What strikes you first when gazing upon the Vigorelli is it's strange thread spool holders, and then maybe the color. There is very little information about this sewing machine besides the following statement mined from some blog posting comments, " Vigorelli was an Italian brand that started as a spin-off of Necchi (being Mr Vigorelli a former Necchi engineer) in the same town. The Robot model was the first one having an internal camstack that let you change up to 5 different stitch “on the fly”." I pulled it out of the table and took it to the check out counter to examine more closely. Of course the first thing I noticed is that it was entirely frozen up, as in, no movement whatsoever. What luck! I've never had the opportunity to bring a comatose machine back to life. Listen... it's an opportunity not everyone understands but believe me, those who know really know what i'm talking about here. They've started to know me there at sister thrift and when they saw me looking at the Vigorelli they got pretty excited. I guess it's been hanging around for quite a number of years and I could tell they were anxious to be rid of this boat anchor. They threw an offer on the table I couldn't refuse: $9.95 and I could leave the table. SOLD! I didn't even know until I picked it up later that it came with a whole bag full of feet and accessories including the holey grail of vintage machine paraphernalia..... The original manual! I could go on forever about this machine but I'm not sure anyone really cares that much about it being a rather unheard of name and questionable lineage. I do happen to really enjoy this particular passage from the embroidery manual that was included with the machine. I think it reaches much further than simple embroidery and it's good to see the manufacturer was passing these inspirational tidbits along to the home or "shop" sewer. It took me around 10 hours to get it up and running properly. This included lots and lots of oil and adjustments to the zigzag mechanism which only did about a half a zig before it zagged. There are two remarkable features of this machine that sets it apart from other machine of this era. It has a needle position selector that lets you select left, center, or right needle and... it also uses a cam to activate the zigzag stitch. This zigzag setup is similar to the Singer 500A but much more simplistic. The cams are made of some sort of plastic and the Singer 500A is all metal in that department. All in all it's a pretty awesome machine that produces a very nice stitch. Dream machine? no...... but a good collector's items yes! OH yeah.. "Robot" referred to the automatic embroidery mechanism... fancy right? Yesterday at our local Flea Market, I found a Lida Automatic by Vigorelli with the attachments, case very portable, several cams and was so excited. Could not find any information except the same quote that you printed. It is jammed and I am bummed, I thought I could start to sew with it, but even after oiling, it is stuck. I can't really spend much to fix it and do have a vintage Elna that I use daily. But, this machine is so cute, seems alot smaller than the one you have. I would love some advise? That is a handsome machine! Your eyes do go straight to the thread holders, like its Neptune's sewing machine! (If he had one!) ha! I also like the little coat of arms on it. Thanks for the Necchi advise! ack, it said my first name, Jeanne. I am Christianne. I sent you some photos of a necchi for sale. Thanks for the post on "Scratch Out". Good God! Great stuff! My Vigo who now looks the bomb instead of like an army truck! It looks so good I can almost forgive the dumb #%* bobbin access! Yes! Scratch Out is amazing stuff! I love it... It's great on scratched CDs also! Wow; it even comes with a felling foot. Cool! Brian, I acquired my Vigorelli from my parents. It was brand new when they bought it, is in a full-size mahogany cabinet with 4 drawers and a pull-out spool drawer...has all the attachments and cams too, plus instruction book. It works too, but lately it skips picking up the bobbin thread at times, so I was wondering if you had any suggestions as to what I can do to remedy that. I love the machine and don't want to have to buy a new one. Hopefully you know what I need to do...perhaps adjusting tension dials, etc. Help!!!! Brian, That's a beautiful machine. Got any before pictures? How did you get such a shiny finish on the paint? I just bought the sister to this machine, but have yet to pick it up. Didn't get any accessories, but did get the desk type cabinet it came with. Can't wait to see it and see what I really bought. you can even sew blindfolded! AWESOME! Very Cool! We just got one with manual, supplies, and cabinet (needs work) at a local Salvation Army. In the desk was the original sales receipt from 12/24/1964--yep a Christmas Present. Any idea where to find feet and cams? I inherited my Vigorelli ZZ/A Robot from my mother-in-law, in 1970. Its done everything I need ever since. Its a great machine, dearly loved! Only problem - the rubber ring that spins the bobbin to reload it with thread - has perished and I need a new one. Any suggestions about what to do to get a replacement? As I live in South Africa, it would be best if I could use a standard rubber ring that would be easily available. I was looking online for this exact vintage sewing machine when I came across your page. My grandmother is a Sicilian immigrant and learned to sew at a very young age. By the time she was 13, she was designing and creating dresses for all the girls and women in her hometown. She would always tell us the story of how my great-grandfather had to save up all his money (and still needed more) to purchase this machine for her from a merchant that came from a few towns over. Her first project with this machine was my great-aunt's wedding dress (my Nonna only being 15 at the time). I was wondering if you were considering selling this one? I know how much it would mean to her if I could find her the very first machine she over owned in such pristine condition, especially since her first one didn't even look this good. If it is not for sale, do you know where I could find one? Hello, I just bought one from a thrif store for $5.00, My son and I are rebuilding it for his girfriends valentine's present. Does anyone know what years these Robots were made? I would like to give an estimated manufacture date. Just received a Vigorelli Stretch & Sew E75 machine, a wonderful orange 60-70's machine. Does anyone have any info about it, or know where to get parts? my mother just fund an old vigorelli robot, but without manual. do you maybe know where i could download it?? 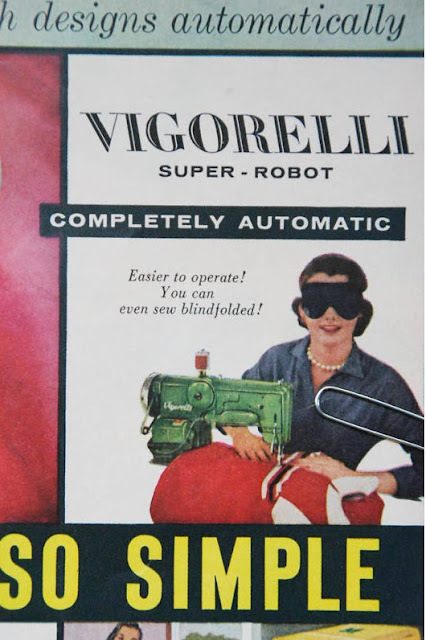 My mother bought her Vigorelli Robot in 1957 from a sewing store in Chicago. It's exactly as pictured. My mother was wonderful at sewing, she could make anything on this machine. But the machine only liked her. She tried to show us kids how to use it. It would work for her, but not for us. She said we were doing something wrong. She never had any problems with it, we had all the problems with it. She passed on and my sister got it. She took it in and had it cleaned and adjusted. Even now it still looks new. But when you try to sew on it, it jams up and the bobbin threads break. So there is sits unused. Come on' it's not THAT ugly a machine! At least it's all metal rather than plastic! I have a Vigorelli machine, but cannot use it any longer as the spool has some problem. I cannot find any agent for Vigorelli in South Africa - and would really like to continue using my machine in stead of bying some other brand. How can you assist me, please? These Vigorelli sewing machines also were manufactured in Brazil during decades. The factory was closed in 80´s decade and they built one mall center at same place. Still you can find some old Vigorelli sewing machines at antiques shops but it´s difficult and rare.